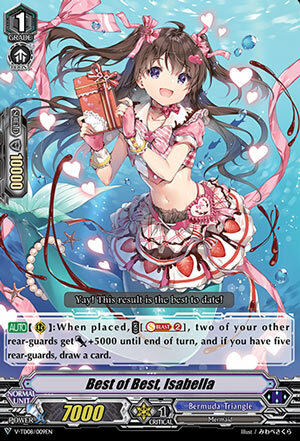 [AUTO](RC):When placed, COST [Soul Blast (2)], two of your other rear-guards get [Power]+5000 until end of turn, and if you have five rear-guards, draw a card. She works. I mean she’s 7k base and thus won’t hit a lot of thing unboosted if you ride her, you need to be in Mid/Late Game before she can let you draw anything, but at least extra power to columns (a whole 10k to one column to anticipate triggers usually) is nice. Probably abuseable in Premium or something though so go check that out if you must.